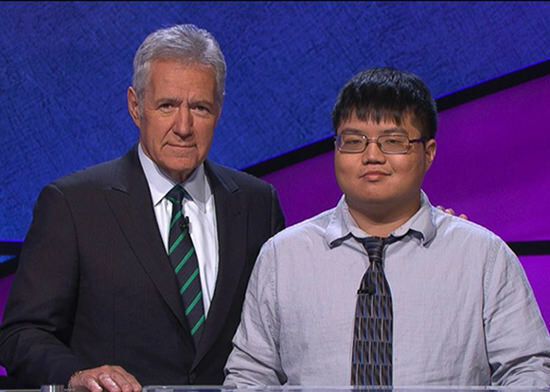 Arthur Chu won’t be on “Jeopardy” this weekend. Like most of America, he’ll be watching the Academy Awards. I stumped him. Chu doesn’t know. “’12 Years a Slave’ nominated?” he asked. The 30-year-old champ has an excuse. He’s been too busy climbing to the third highest in regular game earnings in “Jeopardy” history, amassing $261,000 during a multi-week streak that’s attracted one thing for sure–racism. Chu is what I call a “Jeopardy” artist. He plays the game like Picasso approached a straight line. In other words, he doesn’t. He’s a bit of a cubist in that sense, but he’s not the first to play the game’s answer boxes upside down and out of order. Joke? Semi-joke? These are real sentiments. Real people. And I’m not laughing. Modern racism bubbles up once again. There’s plenty of low in high-tech. It’s also what happens when you don’t conform and don’t act the way people expect you to in America, like Chu. You get a reaction. And yet I’m glad Chu is doing what he’s doing and going strong. He’s certainly made “Jeopardy” more interesting. So in that sense, I hope that watching the Oscar telecast will be as unconventional as watching Chu. The Academy Awards show is live, after all, but rarely gets out of its canned state. And who can decide that? The winners, on the spot, of course. The ones who get to cradle Oscar and perhaps have the chance to use him for his rightful purpose. If you know that the winner of an Oscar gets 30 seconds solo in front of, say, several hundreds of millions of people worldwide (not a billion, but a worthy total), you can understand why on Oscar night most people just chicken out and do a standard TY to agents, family, and collagen. I mean colleagues. There’s something about the default, the safety of the routine. It’s the way things have always been done, which is the way the powers that be like it. But doesn’t it seem strange at the event where we honor all these creative people for their artistic risks? In the end, the black-tie and designer gown are just the straitjacket of conformity. That’s why the only interesting thing I wait for on Oscar night is whether someone truly grabs the moment, breaks the artifice, and tries to go beyond the routine. Screw the teleprompter, the floor director screaming in your ear, and the orchestra playing you off way too early. Just take a deep breath and say something the world really needs to hear. Now those were Oscar-worthy lines, more difficult to deliver than anything in “American Hustle.” And they were real. Not a fiction. And then there was Sacheen Littlefeather in 1973. Will someone speak out this time around on the slow progress of more than 40 years, and the lack of diversity that still exists? Or will the Academy pre-empt any surprises by pulling a surprise of its own and honoring a film like “12 Years a Slave“? For way too long, that benign image of slavery has sugarcoated history for many. But “12 Years a Slave” is unabashedly honest. You can hear the “N” word in all its hateful, historical glory. You can see the fresh welts of slavery throb on screen. If the movie wins, then I will forgive everyone for being on such good behavior on Oscar night. Of course, there’s always the hope someone will talk about something else real, like inequality. People surely will be be dressed for the occasion. Some might question whether the Oscars are really the time and place to speak out. You mean with several hundred million globally hanging on your every word? Or is that the time you want to be invisible? It’s harder for Arthur Chu to be invisible now. About ten million viewers watch “Jeopardy” every week in the U.S., and for at least two weeks (and maybe more), Chu is our proxy. One of the faces of Asian America. But the vicious, often racist, tweets about him from others? Yet more offensive in his mind were the responses from people who masked their racism. They were the ones who commented on how Chu didn’t play the game right, or didn’t respect the game’s etiquette. It was as if some were trying so hard to prove that the flood of negative reaction had nothing to do with Chu’s Asian American-ness, or some stereotypical view of him, but just simply the game. Chu even cites the example of another player, Ben Ingram, who last year won almost as much money and used the same out-of-order strategy to play the game. But Ingram was never branded like Chu as the villainous bad boy who was sucking the fun out of the game. “I’m not going to say it’s entirely a racial thing, but come on, there’s a racial component to it,” said Chu, who is almost as offended at the denial that race is an issue. Chu believes it’s the spillover of anti-Asian sentiment in other parts of society, as he says Asian Americans are still under-represented when it comes to being “Jeopardy” contestants. It wasn’t the matter of “here comes another top Asian ‘Jeopardy’ player” messing things up by playing the game upside down. But it’s clear–although it’s changed a bit the longer he stays on–the audience didn’t immediately relate to him. “When I hear people say they don’t like me because I seem so focused on only winning the game…and not a well-rounded, likeable individual, it’s hard to not hear racial echoes in that,” Chu said. Like I said, he’s not the first to play the game in that aggressive, lemmings marching to Final Jeopardy Way. He’s just the latest, who happens to be non-white. An Asian American. As Chu admitted, it’s an old story. But he’s found a way to fight the legacy of racism as it comes up. Old style or new style, he’s taking it head on, on his terms, while playing to win aggressively and within the rules. He knows the pressure is on. in society can easily be put in jeopardy. Listen to more of my Arthur Chu interview in part 1, including how he says his playing style allows for race to “amplify” stereotypical reactions inside people that normally wouldn’t be forthcoming. And in Part 2, Chu talks about how he’s faced racism in the past before “Jeopardy.” He says he’s always been aware that racial minorities are treated differently and talked about it with his father, a Taiwanese immigrant.